WHITAKER BANK BALLPARK (Lexington, KY) - The Kansas City Royals have named their Minor League Players and Pitchers of the Year for the 2018 season and the Lexington Legends have three representatives on the highly respected list; with another five former Legends on their respective teams. Two pitchers who helped the Legends win the South Atlantic League Championship in 2018 were also given these awards on their former teams. Outfielder Seuly Matias , 20, was named Lexington Co-Player of the Year. He hit 31 home runs, sixth most in the minor leagues, despite playing in just 94 games. His season ended prematurely due to injury on August 13, at which point he was tied for the minor league lead in homers. He homered in each of his first three games, including two on Opening Day, his first of four multi-homer efforts. He earned midseason and postseason All-Star honors and was named to the SiriusXM All-Star Futures Game in Washington, D.C., where he went 2-for-3 including a home run. Matias was signed as a non-drafted free agent out of the Dominican Republic in 2015. Catcher MJ Melendez , 19, was named Lexington Co-Player of the Year. He slugged .492 with 19 home runs (5th most in the South Atlantic League and 4th among Royals farmhands) and 73 RBI (4th in the league and tied for 2nd among Royals minor leaguers). He also ranked among the league leaders in extra-base hits (54, 2nd), triples (9, 3rd), total bases (206, 5th) and slugging percentage (5th), and was named a South Atlantic League midseason All-Star. His 19 home runs are most by a teenage catcher in the South Atlantic League since at least 2006. Behind the plate, he threw out 26 of 62 attempted base stealers (41.9%), which tied for the league lead among qualified catchers. Melendez was a second-round pick in the 2017 First-Year Player Draft. Right-handed pitcher Carlos Hernandez , 21, was named Lexington Pitcher of the Year. He went 6-5 with a 3.29 ERA (29 ER in 79.1 IP), 82 strikeouts (9.3 K/9) and just 23 walks (2.6 BB/9). He allowed just one unearned run over a three-start stretch (21 IP) from June 29-July 9, in which he allowed just nine hits. In the last start of the streak on July 9, he recorded a career-high 12 strikeouts in a 2-1 win vs. Greensboro. Hernandez was signed as a non-drafted free agent out of Venezuela in 2017. "The 2018 Legends team was full of talent and incredibly fun to watch." 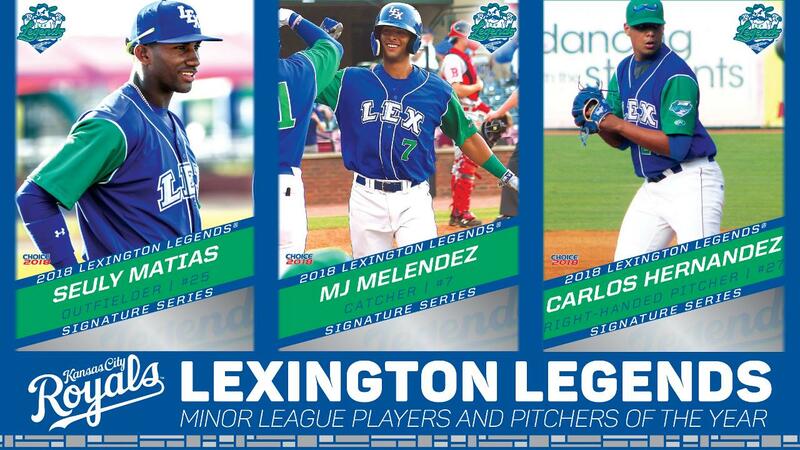 says Legends President/CEO Andy Shea "You never know who you're going see come through Lexington and these three players are just a few of the talented individuals we got to watch this season." Former Legends, Frank Schwindel, Jecksson Flores, Jake Newberry, D.J. Burt and Gerson Garabito were awarded these honors. J.C. Cloney and Marcelo Martinez were given these awards for their previous teams, but were instrumental in helping the Legends claim the South Atlantic League Championship. 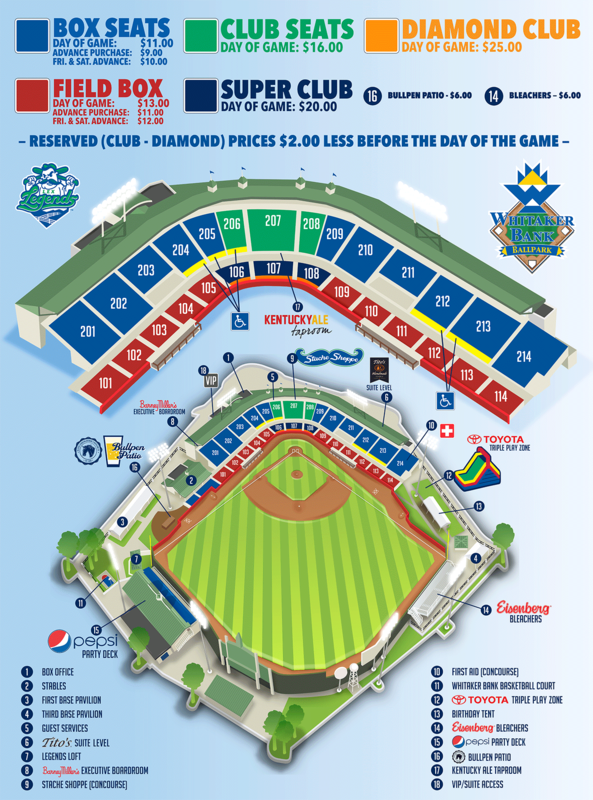 Opening Day 2019 will be on Thursday, April 4th at Whitaker Bank Ballpark versus the Delmarva Shorebirds, affiliate of the Baltimore Orioles. Ticket packages start at just $96 and are available now by calling the Legends Box Office at (859) 422-7867. Or visit lexingtonlegends.com The Legends, a Class A affiliate of the Kansas City Royals and member of the South Atlantic League, play all home games at Whitaker Bank Ballpark in Lexington, Kentucky.